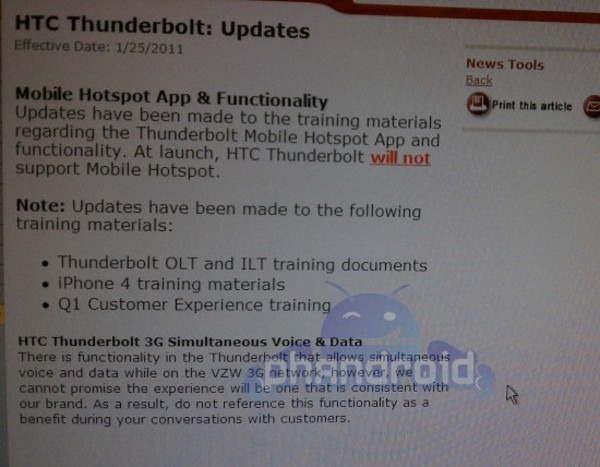 With training for the HTC Thunderbolt starting today, a few Thunderbolt goodies surfaced. According to the leaked screenshot, the HTC Thunderbolt will be able to handle both voice and data simultaneously on Verizon 3G. As many of you probably already know, Verizon's CDMA network was incapable of producing this in the past (voice and data use separate channels on CDMA), but apparently HTC and Big Red have done some magic and figured out a way on this new 4G device. Not too sure yet on how they did it, but I can't wait to find out. Honestly though, does this make anyone want a Thunderbolt more than they did before, or is this device just "meh" for you?